I don't thin that it will repeat ever. Pitty, as Ooze quest is a gold mine for several type of rare resources, like Mystic Tomes or Tokens. Last edited by Pol on Mar 18 2018, 22:39, edited 1 time in total. Steven & Panda, please if you have the chance invite the new players. From low tiers, Bronze, Silver, is actually easiest. Whereas from Gold it's like impossibru. Just one or two at most, right? We don't want the place getting crowded with people we have no idea who they are. Last edited by Panda Tar on Mar 19 2018, 18:45, edited 1 time in total. Always get the wood and ore from merchants, you WILL need it. Priority for Kingdom is librairies so you can research, then you want to rush keeps and shrines which goes along castle levels. I don't remember about the archivist research. It's related to the Library. You need it to keep upgrading Library. Oh then yes, Library produces scrolls. Priority kind of depends on your preference I guess. As everything requires wood and ore I always max them and keep them at least 5 levels above the rest. In my case I'm upgrading Gem Mines as I don't have crosses to upgrade shrines. Hopefully I will got them meanwhile. Then it will be brimstone, so be damned, it will take a loong time.. I have quite surplus of scrolls and still buying wood, ore, mercury and sulphur. Without merchants it wouldn't be possible. The mines production itself would be too slow. Damn, it looks like the game has shortage of something only so you can balance to have shortage of another, yes? wimfrits wrote: Priority kind of depends on your preference I guess. True, I meant optimal rush for competition but for sure you can prioritize gems or whatever. You need scrolls for any researches tho. Best income for wood and ore is merchants, by far, increasing every 5 castle level. Well, we now have 2 new members and we will F I N A L L Y have those swag bags taken care of. Last edited by Panda Tar on Mar 20 2018, 20:16, edited 1 time in total. Panda Tar wrote: Well, we now have 2 new members and we will F I N A L L Y have those swag bags taken care of. A great day - got a random legendary on a diamond idol - first time that happened! Panda Tar wrote: Damn, it looks like the game has shortage of something only so you can balance to have shortage of another, yes? Yeah, just thought of downgrading idea today myself. ^_^ And you could use your own Library to do that, another Kingdom feature, perhaps? Sometimes, the quests don't have the books we need. Luckily, that Evil Eye quest reappeared and I can farm again the Healing book. And I'm not sure, but I think I got 2 times those merchant visits yesterday night. They sold me many scrolls, around 1,500. They've read my mind. And thanks for unstucking those swag bags! Just placed 5 there for you folks. Troller wrote: A great day - got a random legendary on a diamond idol - first time that happened! My last Legendary was like that, Ifrit, if I'm not mistaken. The funny thing it was a succession of luck. That diamond idol I got from a small tent randomly generated on the Big Machine Spider quest at Prince level. Then the Diamond idol became the Ifrit. However, couldn't even give any love to my Ifrit while I'm trying to evolve some other key-creatures. My big bloober green legendary one also needs some love. Very good one to combo with poisonous units, including Cerberus. I just so love Cerberus right now. Last edited by Panda Tar on Mar 21 2018, 13:48, edited 2 times in total. To your question Panda, yes I beat the Stego, twenty minutes before deadline. Used combination of Statue, Oathkeeper (been forced to upgrading it completely from the ground) and Vampire. The rest probably wasn't important. Actually burned all money and diamonds, in process to get here - yep, tinkering with silver enchants. The only luck here was, that Stego couldn't also cast Dispel, otherwise it was a nasty creature. Yellow heals instead of double damage, chain lighting, power and def boost, healing, tail attack..
And received one red and one white leg essence, one swag bag, and maybe also something above that. The reward was certainly pleasant. And now please that one red epic essence. I need to finish my Shaman. Last edited by Pol on Mar 26 2018, 11:09, edited 3 times in total. I tried to recruit 2 more. A lv 350 or something and a 200+-. One attacked me, the other I attacked. Not sure if I made good impressions there, . Might look like the whiny babycry after the big leveled guy, or the hypocrite one, trying to apologize. The other time I found the strong LV 68 guy was also from Gli Italiani, although I don't think it's the same one, specially because this one is lower level than the other. 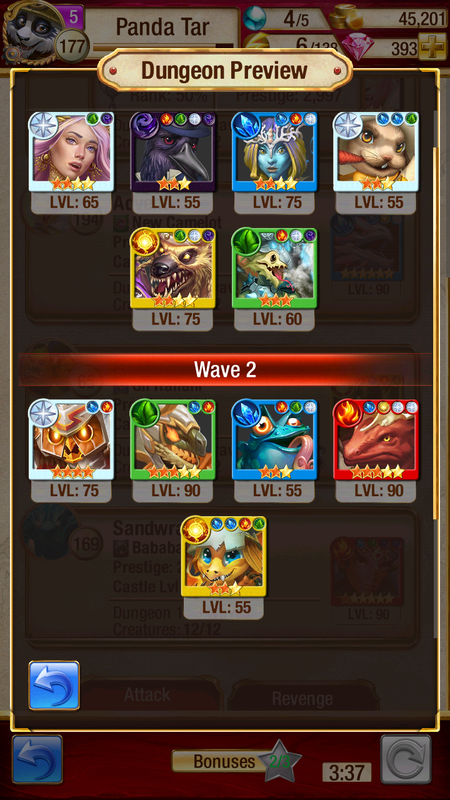 Still, I just got my owl fully awaken, and this guy has not only that one, but even some lv90 epic ones 70% awakened. Or, it would be a seasoned player with new account, if that's even possible. Last edited by Panda Tar on Apr 3 2018, 14:00, edited 1 time in total. I woud think that this is possible, but for that he needs to be a VIP, and also max VIP, cause without real money infusion, this looks not plausible.